I love writing romance stories, and although I earn money from it I’ve never considered it a job—more like a passion. Probably because I’ve always had stories and characters and plots in my head. I do realize that I’m very, very lucky. Not everyone gets to do something they love in order to pay the bills. Don’t get me wrong, the majority of authors usually have to have a second job to make ends meet. We aren’t all Nora Roberts. The test I use to know if the work I’m doing is something I love is the ‘if I won the lottery’ or lotto as it’s called in NZ, would I still write? The answer is a resounding yes. LOL, don’t get me wrong, a lotto win would also make my life a lot more comfortable. In addition, I have to say the romance writing world has opened up more than just an income. I’ve made so many new friends from both fellow authors, and readers—all around the world. That has been the best part of my writing journey. The people I’ve met all love one thing, romance stories. We have something in common regardless of where we live in the world. The other thing about being a romance writer that I LOVE is the perks. What do I mean by perks? It’s the knowledge and teaching that other authors are always happy to give for free. It’s the cover quotes they provide when an author loves your story. It’s the promotion authors do for each other, and it’s the free books I get given from fellow authors. Today I went to my PO Box and I had a lovely parcel waiting. I love getting parcels. I got home and excitedly opened it to find a friend I made through romance writing, Angela Bissell, had sent me her new book and when I opened it, she’d dedicated the book to me!!!!! I was so thrilled. 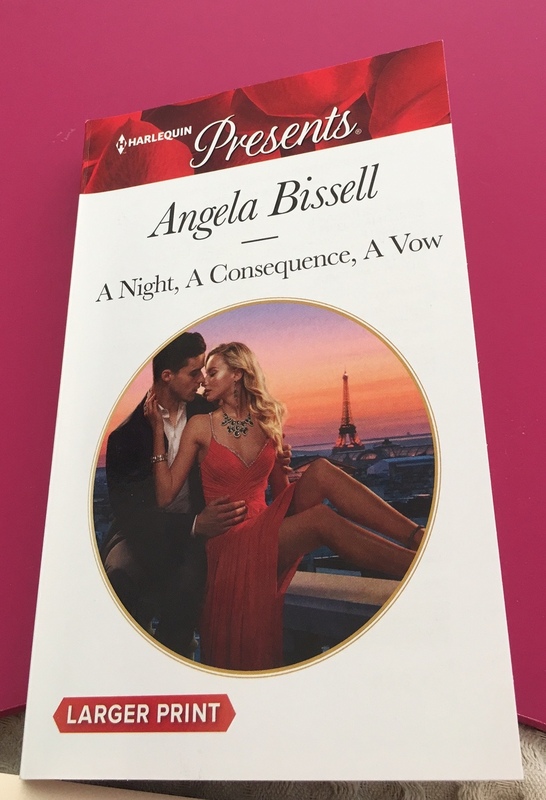 A Night, A Consequence, A Vow. Angela had never written when she joined RWNZ and I was already published. But I could tell from her first synopsis that she read out at a RWNZ meeting that she was going to be a fabulous story teller, way better than I. All her work is full of emotion. She put all her heart and soul into learning her craft and I hope I encouraged her along the way, and now this is her third book and not only that, she has signed with my agent too. I get such a kick out of helping my fellow authors achieve their goals and seeing someone learn their craft and become successful. So, thanks Angela, it has been fun and your friendship is worth a lot to me and I love that we have something that we can both enjoy—stories. What is it that you love about your job? What makes you want to get up in the morning? If you won lotto what would you do with your life? I’m a retired teacher so I could travel at any time. My daughter and son-in-law still owe some on their house so I’d pay that off. And I’d donate to my favorite charities.